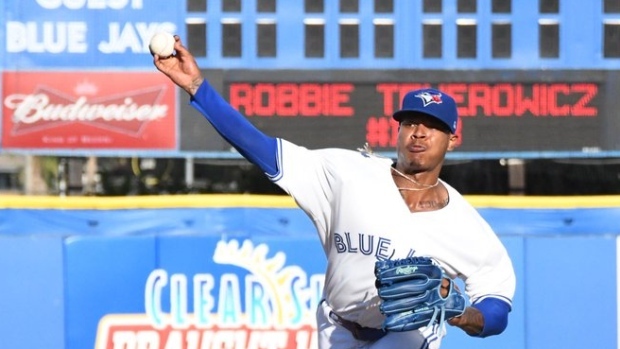 Toronto Blue Jays right-hander Marcus Stroman allowed one hit and gave up two runs in a 4.1-inning rehab start Wednesday in Dunedin against the Charlotte Stone Crabs. Stroman threw 60 pitches, 34 strikes, and finished with four walks and three strikeouts. He is expected to make one more rehab start according to TSN's Scott Mitchell. Stroman has been on the disabled list since May 11 with shoulder fatigue. He was struggling prior to the move, with a record of 0-5 and an ERA of 7.71. "(It) just got to a point where it became very frustrating physically and mentally," Stroman said. "Just at a point where I felt I had to work at 115, 120 per cent where I would normally be working at 80-85 per cent to do what I do out there. Last season, the 27-year-old was 13-9 with an ERA of 3.09 and went more than 200 innings for the second straight year. Following a four-game sweep of the Baltimore Orioles at Rogers Centre, the Jays were swept by the Tampa Bay Rays to drop their record to 30-38, good for fourth in the American League East. Toronto will welcome the Washington Nationals to town Friday for a three-game set.